The way I came up with this graph was by modeling the solar cell power curve based on Google’s Solar Panel Project, which they update daily for solar electricity produced. You can presume at this point some hypothetical number of panels to produce 36 GW at peak power. 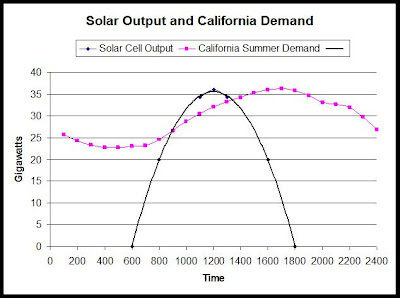 The reason for 36 GW is that I found a presentation that showed actual load behavior in California on a summer day in 2003, and peak power demand was 36 GW. It became clear to me why some people are approaching this from different directions, and why neither answer is actually correct. One approach looks at peak demand, and installs enough solar panels to meet that. But as you can see, peak demand doesn’t correspond to peak output. The second approach looks at the demand for the entire day, and then attempts to produce that in 4 or 5 hours. That isn’t correct either. You need to produce the required daily output in the total area under the solar power curve. But, you need to be able to store it. And due to storage losses, you actually need to produce quite a bit more than you expect to be consumed in any particular day. That, I believe, is the correct way to solve the problem. In all of the approaches I have seen as I have studied the problem, I haven’t seen this specific approach. Thoughts? Just eye-balling it, it looks to me – presuming you have a workable storage solution – that you would require about double the power of the peak demand number in order to produce the required energy each day. In other words, if that solar power curve topped out at 70 GW or so, that would be enough energy produced in a day to meet that demand curve. I don’t have time to work on this any more right now, but I will come back to it. My chapter is due on August 1, and I am still tidying it up. But I think the next approach is to either integrate the area under the solar output curve, or approximate it as a square wave – and then develop the relationship to daily demand.